This month's interview was amazing. I got to interview my toy knitting hero, the legendary Alan Dart. (I'm not already gushing too much am I? I'll try very hard to be cool, calm and collected here on the blog but just know that inside I'm secretly babbling like a fangirl). In many of the places I inhabit in cyber space, I go somewhat incognito. I hate having my photo taken except for family purposes at the best of times and once nearly strangled an uncle who tried to videotape my wedding against my express order (that's a story for another day though). This little guy, The Party Penguin has been known to bravely stand in for me and preserve my "air of mystique" (thanks to Alan for the lovely phrase). The photo above is one of the few photos of Alan existing on the internet as he admits to a similar aversion to being photographed. He told me he keeps well away from cameras. Party Penguin: Pattern available for purchase here. Party Penguin is one of the first Alan Dart Patterns I can remember owning. He's also one of the first Alan Dart patterns I knitted. This is actually Party Penguin Mark II as I had previously made one as a gift for my daughter's ballet teacher. This little guy kicked off a life long fascination with Alan's knitted toys and an abiding appreciation for Alan's design and pattern writing skills. So here's my conversation with Alan. My questions are in bold with Alan's answers after them. 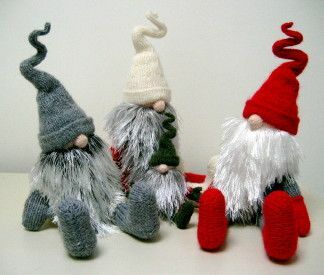 It's somewhat unusual to find a male knitter firstly; male knitwear designers are even more unusual and male knitting designers who make toys are an even rarer breed. What's your background in knitting like and how to you come to design toys specifically? (Note: this is a compilation of lots of answers Alan gave to questions about his childhood crafting habits, his time at Art college and his early work for various magazines and on children's TV in the UK). I can't think of any specific thing that started my interest in handicrafts, but I've always made things and my mother was very willing to pass on her skills and to encourage me. As a child I made glove puppets and string puppets; knitted clothes for my teddy bear; Christmas decorations (starting in the school Summer holidays! ); cellophane stained glass windows; paper sculpture (I had an exhibition entitled 'London' for open day at school, which included Eros, Buckingham Palace and a Beefeater). I first learnt to knit on a machine when I was four years old. My mother had a very basic Passap machine, and I asked her to teach me how to use it. Later on I learnt to knit by hand (probably when I was about six years old), and I can't really remember a time when I couldn't knit. When I was a teenager I bought a Knitmaster knitting machine from a catalogue, on which you could knit fair-isle patterns, and I started to make sweaters for myself, so I suppose that was the point I realised I had a talent for it. I didn't particularly want to design clothes, but the choice of courses at art colleges was very limited when I was young, so I opted for fashion because this involved working with fabric and yarn. I also designed shoes and studied textile printing at college. One of the tutors at college was a freelance designer who had worked at the BBC, so when I left college he asked me to help him. I worked for him for a year, and then started up my own one-off machine-knitted sweater business. During my first job, some of the people who came for fittings noticed the sweaters I was wearing and asked me if I would make knitwear for them. The toys came later. I can't exactly remember what my first toy was, but I think it was when I contributed to partwork magazines (published by Marshall Cavendish and Eaglemoss), as their titles covered a wide range of handicrafts and I was willing to give anything a try. Apart from fabric and knitted toys I designed features on patchwork, fabric painting, papercraft, appliqué, embroidery, salt-dough modelling, you name it. My first job for a magazine was to design 'his and hers' machine-knitted outfits for Danny la Rue for a feature that appeared in the now defunct Reveille! Much later, the editor of Mother magazine introduced me to Anne Wood, who was then the children's editor on TV AM, and she asked me to demonstrate crafts for children on the Rub-a-Dub-Tub programme that she produced. After that she started Ragdoll Productions and I designed more crafts for Pob's Programme, which she produced for Channel 4. When I first discovered your work it was when you were resident knitted toy designer for the English Women’s Weekly (which we get here in Australia). I was under contract as the resident toy designer for Woman's Weekly for 18 years, but when the current editor took over about 4 years ago she decided that she didn't want to feature so many toys and terminated my contract. That is what prompted me to start my website, although I'd been thinking about it for quite a while. Part of my treasured collection of Alan Dart character patterns from old English Women's Weeklys. Kipper the Dog, Thomas the Tank Engine, Shaun the Sheep and Gromit and the two Beatrix Potter Collections. And no, I will not photocopy them and send them to you. I respect Alan's copyright of these (See our also our discussion of copyright issues below). At this stage, a lot of your work was produced knitted versions of licensed characters where you had to reproduce a known design. This was because I designed these toys for two companies. Initially Intarsia UK, and then TDB, both of whom bought the very expensive licenses that allowed them to sell licensed character toy leaflets, and they often gave Woman's Weekly one character from a collection to publicise the other leaflets. The licenses were for a fixed period, so they have all now expired, which is why the patterns can no longer be sold. I still own the copyright to the patterns (as I do to all my designs), but would need to buy a license for each character collection before being allowed to offer them for sale, and this isn't something I could afford to do. Batch two of my precious Alan Dart Patterns, Three Little Kittens, The Bridal Bunnies, Angelica and Tommy from Rugrats, Noddy and Paddington Bear. I swear these are among the first things I'd save if my house was on fire! But you seem now mainly to create your own characters. I prefer to do this because I can then offer the patterns for sale on my website without having a licensing company involved. What triggers a new design for you? I love Swedish and American folk art, but I'm not consciously inspired by anything specific. I work out a whole year's features at a time, and tend to use the seasons to dictate the subjects. Of course, having been designing for so many years it's getting harder each year to think up something for Christmas, Easter and Halloween that I haven't already done in the past. Is it easier to design a toy based on an existing character or on a new idea? I suppose it's easier to write a pattern for one of my own designs because the licensed characters weren't originally designed with the intention that they were to be knitted, so some of the details are tricky to represent in yarn. Is copyright a bigger issue now than it was 20 years ago? I've always retained copyright to my designs, and this is how I can sell them (apart from the licensed character patterns) via my website. The vast majority of people are very honest and respectful of my work, but there are still quite a few people who think that they have the right to copy a designer's work and sell it to make a profit for themselves. They use the excuse that it's 'out of print' or 'vintage', but copyright exists until 70 years after the holder's death, and I'm still very much alive (albeit verging on vintage)! Copyright infringement is the same as theft, and now home computers are more common than they were 20 years ago the instances of illegal duplication have multiplied greatly. Most hosting companies are covered by the Digital Millennium Copyright Act, so I am able to file a report and have any offending listings removed, but it takes a great deal of time to keep on top of the infringements and protect my property. The beauty of knitted toys for me is the three dimensional sculptural element (not to mention the squishy cuddly element and the sheer cuteness factor). 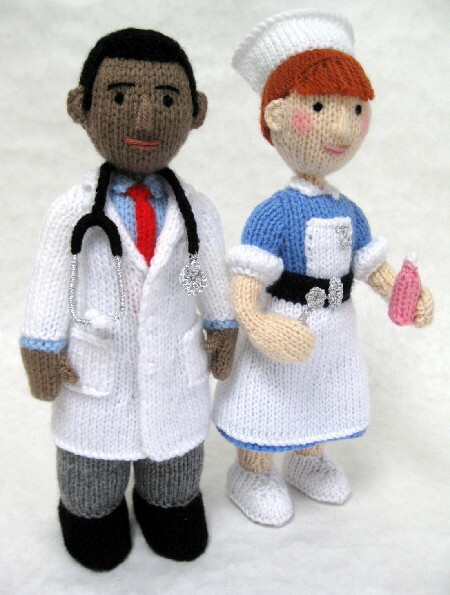 Unlike a lot of other toy designers who create toys to be knitted in the round, you design your toys as a series of pieces to be knitted flat and later sewn up. Is there a particular reason you design this way? I actually don't like knitting in the round, and quite a few people write to me to check that my patterns are knitted flat before buying because they feel the same way. A lot of the pieces in my designs are very tiny, and wouldn't be suitable to knit on a circular needle, and I find that seams add structure to the toys. In addition, because some of the openings are quite small, I often stop sewing a seam a little way from the opening, then stuff the piece, before joining the remainder of the seam. It wouldn't be possible to do this if the piece had been knitted in the round. I also really like sewing up and finishing off, and find the knitting bit quite boring unless there is some interesting shaping occurring every few rows. That's why I always hated making sweaters ..... having to knit 80 rows over the same old stitches! Give me a break! What's the actual process you following when creating a new design? I draw the toy actual size and then use a tape measure to take 3D measurements from this drawing, which I then convert to stitches and rows and write the pattern. I can't easily describe exactly how I devise the pattern, but I'm able to imagine the toy in 3D and can turn it around in my head, and the rest is down to years of experience. I don't experiment and jot down notes as I go along, but write the complete pattern for each piece of a toy first and then knit it. I was never taught how to write a pattern for a figure but just worked out my own method, so I don't know if this is how other people do it. I just like the challenge of creating complex shapes by simply increasing, decreasing and knitting darts, and I find writing the pattern the most interesting part of my job. Do have any particular tricks to help you visualise how to create a 3D object from flat knitted pieces? I don't have any trick, but I've always been able to visualise items in 3D and turn them round in my mind. I don't make lots of sketches ..... just one, full size, that I use to take measurements before working out the pattern. What’s a typical day in your working life like? There isn't really a typical day. I'm either working out a pattern, or knitting, or sewing up, or typing out a finished pattern, or checking the proof pages for the next Simply Knitting feature. Whilst doing any of these I need to answer the many emails that come in via the contact page of my website, and I try to do this as quickly as possible, so always break off from whatever I'm working on when I hear a message come in. At the end of each month I also need to prepare one of my patterns as a PDF file to add to the website, together with new text for the monthly site update. If I manage to get a bit ahead with my work I may even take a day or afternoon off to do a bit of gardening ..... so it's very varied. And where do you work? I imagine your job lets you work from home rather than in an office. (Alan lives in Cumbria in England) ...in a tiny hamlet, in farming country. Most of the properties are farms, with just a few houses, and there are no shops and no bus service. There is a tiny ghyll running along the side of the property, and we have red squirrels and lots of birds, with the occasional visit from a hare, pheasant or hedgehog. The house was built in the mid 1700s, and was originally surrounded by an orchard, which has now been turned into a garden. A stone-built double garage, attached to the house, has been converted into a studio. And finally, do you knit in public and what reactions do you get from people if you do? I don't have any reason to take my work outside, and always knit at my desk in my studio. I'm not knitting-obsessed, and it's my profession rather than a pastime. I'd like to thank Alan for his enthusiasm and willingness to answer questions. It has been wonderful getting to know what makes him tick, so to speak. All photos are taken from Alan's website or are of my own work unless otherwise acknowledged. 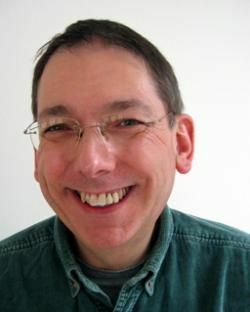 A complete list of all Alan's published patterns is available from his website and is updated monthly by the cool people who run the Alan Dart Group on Ravelry. If you want to read a bit more about Alan have a look at this interview with him on the Simply Knitting site. Maybe I should finish sewing up this mouse? Wow....what a fabulous interview! Alan and his creations are new to me and I am already in love! This was great to get an insider's view of his creative process---I can't wait to knit my Graduating Bunny! Thanks for your kind comment Claudia. I love that Graduating Bunny Pattern too. Beware Alan's patterns are addictive! Thanks for a great article. My late mother-in-law used to knit loads of stuffed toys when my children were small. I've no idea if they were Alan Dart's patterns, but she knitted a Nativity scene, Girl Guides, Brownies, ballet dancers, and my favourite, SuperTed, with a reversible onesie! My daughter is now expecting a baby (my first grandchild), so rather than knit little cardigans, I thought I'd carry on the tradition of knitting stuffed toys. I found your site while looking for a Peter Rabbit knitting pattern online. Now I know why the only one I could find is so expensive, but it will definitely be worth it!. I think the pattern itself will become more of an heirloom than the knitted bunny (if I ever get it finished, my knitting skills are quite rusty). Thanks for sharing your lovely story. It's interesting that Alan's work has now become inter-generational. Have funny knitting Peter Rabbit (with your incredibly expensive pattern) and I'm sure there will be love worked into every stitch. And your daughter will remember her grandma and those childhood toys because of it. I LOVE ALAN DART! I'm 14 and i sometimes buy simply knitting 4 his patterns, just bought one with 'Holly and Ivy' christmas elves knitting patterns . can't wait to knit them!!!! i also buy patterns from his website. thanks for the interview. i think Alan's knitting is awesome and its unfair how people have cheated and copied his work. He is the King of toy patterns and he is so humble and it was so fantastic to hear more about him because i spend so much of my life knitting his creative patterns away and i always wanted to know him because i love his patters very much. Now i feel i do and he sounds as wonderful as his patterns are! Absolutely love his designs..have most of them from 1982 onwards and intarsia patterns..would never part with any..keep for my great grandchildren when they get old enough.your interview was a lovely insight into a private man.